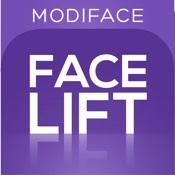 Virtually try on anti-aging and cosmetic surgery effects on your own front and side photo with FaceLift by ModiFace. This is the MOST COMPLETE cosmetic surgery visualization app, with over 20 effects that can be tried, including facelift, nose job, nose reshaping, skin changes, brow lift, lip augmentation, and much more. Whether you want to remove wrinkles, reshape your nose or enhance your lips, this app does it all! You can see effects applied instantly to both the front and side view of your face! Once your virtual cosmetic surgery is complete, you can then save and share the makeover!